Each person has the obligation to find the divibe spark within him/herself because it is absolutely unique and absolutely infinite. A person who has not achieved this before he dies has not become a student of Rabbi Nachman. Please check your pulse or run to the tomb and start begging. Wine on Purim. Maza on Pessach. Man in the desert. Shabbas Hallah on our own land! I speak English, so what is the relationship between these three forms of nourishment? Gobble food down like a kid. Get subsidized like a Bar Mitsvah Man. Last but not least ... The long day of rest! Head of the Children of Israel. "Rosh Bnei Israel" (Rabbi) there can only be one? What if someone is completely nullified to the Rabbi does he become an extension of the Rabbi? If this is his choice and he has successfully proven his nullification then yes he can be one of many Rabbis, you can call him/ them Rabbi Na Nach. Each proven Na Nach can hold this title. Previously there was a King in Israel that earned that title in the plains of Gush Etzion by defeating Goliath. Then the High Priest of the Jews under King Achashverosh was crowned in Sushan. Nanach received his credentials in Tiberius. Where did you get yours? Rabbi Nachman of Breslev being the second son of Rachel is really above and beyond all the others, except that the student is twice the teacher, this being the will of the teacher (LM). So you are a Na Nach? The Satan did not retire as we and Gd would have wished...he dissobeyed and stayed on the job. Did he do this out of loyalty or dissloyalty? We can now offer him to justify his "mutiny" show it was out of loyalty...the time has come for him to betray his team of nasties by allowing holy joy to spread on the earth and even his instruments be used for this purpose. Since the priestly nation was formed and he felt this decision was not fair to him, he used it as a justification to focus his special power of division on them. When Gd fearing men of truth decide to unite around their priests (Jews) they will become Israel and the angels will have to obey the King of the Angels (Gd). The magic formula to participate in the Exodus this time around is to say "Na Nach Nachma Nachman Meuman"
How POWERFUL is a JEW? On OUR birthday, TODAY! Today on the birthday of Moshe, leap year 7th of Adar, 8 days before the second Purim which is the day of the covenent of Moses (his circumbcision, if he had had one). I would like to underline that calling every Torah Scholar "MOSES" has deep significance and is the genuine truth. Today is the birthday of all real students of Moses. When a person is so passionate about his teacher that he follows his footsteps, he becomes "one" with him. Moses not only took on Haman/Amalek, the servant of Satan, he also took on the Satan himself by uniting the 12 tribes. The task of Satan being to divide (as I showed in the previous blog). The punishment of Amalek is to be split into 4, Agag gets split this way by Shmuel ha Navi. Destroying Satan is not an option for God, as I demonstrated through my little hypothesis "How could Gd punish the angel that saved him at the Tower of Babylon? This angel does not want to retire, Gd cannot force him to". Jews have a valid mission which is to unite in spite of this supernatural adversity being spread between us Jews...and it is only fair since Gd has eliminated the three animal passions from us Jews, and not from others...Being Holy Holy Holy means we have to challenge Satan, which is an assignment on the scale of Moses. We have all become Moses and today is OUR birthday everyone of us. Don't be surprised that Rabbi Natan has more prayers for this day than for any other in Likutey Tefilot, if so, this confirms that today is more significant than all holidays except Shabbat. The most recurring holiday (every week) and the one that happens every 3 or so years and is not even on a fixed schedule, let alone official. If all serious students are like Moses then our mission becomes to solve the problem of the recalcitrant angel; Satan. Since Satan produces music that is enjoyable to the ear and is not directly harmful, but can be very pleasing... I suggest we use this very same music to unite instead of divide. He can be credited for making people happy that otherwise would remain depressed, it is enough to sing Na Nach to these tunes. Satan no longer needs to retire and we can convince Gd to let him have this new mission. This can only be compared to Haman who did us a great favor by UNITING Am Israel and the whole world behind Mordecai, by saying "Am Mordecai" and in solidarity condemning all of us to suffer the same fate as him. Mordecai was the most "Chutzpa" Jew of them all and we also have turned this bad trait into something useful and even necessary to be an efficient priest. A big key opened a lock in heavens gates this 6 of Adar B, the year of the gallop. This is the explanation of why the dischord exists within the priestly nation known as the Jews. It is common knowledge that before Babylon, we were sinners committing idolatry and slavery, after Babylon now having become a spiritual nation, these sins no longer applied to us...A new, much more dangerous foe was now upon us. This foe is probably Satan. He did Gd a favor during the tower of Babylon episode, but refused to retire. Gd owes him one, so he has probably promised not to punish this over-eager angel. Rabbi Nachman says: " why worry, I go before you? Just be stick together and I will be with you." Does this statment make any sense? He came out of a well in Tiberius around 1880 and announced around 1980: "what? You still don't know who I am? I am Rabbi Nachman, Head of The Children of Israel, Rabbi Na Nach Nachma Nachman Meuman." If this is the case, then Rabbi Nachman did come before us. If this is the case, HE is the 12th Imam (Shiites claim he will come out of a well, I would call him the 13th because he leads the 13th Tribe.. which is from Rachel ONLY). Like Jacob he needs ALSO to be brought to Jerusalem in the Holy Land by all the elders of the civilized world. To avoid conflicts with the Socialists, Communists and Seculars, these leaders need to enter the land and participate in the funeral, just as they did for President Peres. Participants will all merit thereafter to wear the title of leaders of Israel. All these respective nations will be Zionist Religious Nations, protected from Idolatry and Slavery. Jews are in a live or die battle with Satan and Gd is keeping out of it. Nations of Ninve need only to seek the truth with all their might to understand that bringing the bones of Rabbi Nachman, like they did for Jacob, will allow Michael to slaughter Satan or convince him to ask for, and receive, a more benine mission. These nations will become the united 70 of Jacob, the man of truth, Israel. The word of Gd is good. Ours isn t. Gd created Priests and gave Israel physical action commands like walking to Jerusalem and giving Tzedakka, why? Quite obviously our word is not good yet, the Priests are not tested they are created and formed at the furnace. Israel needs to keep the promise for Gd to keep his (but they don t know it). The priests need to know the truth in order to teach it, and THAT is their choice to make. Pessach like shabbat needs an eight light to be completed (malave malka). The two candles lit on Shabbat are called THE Shabbat light. This is no coincidence. Similarily the exodus from Egypt is not completed without the celebration of the the "Mimouna" the first new national religious holiday since the reconstruction of the second temple. This holiday is related to the removal of the bones which is the final stage allowing for the crossing of the Sea of Reeds and the reclaiming of the town of Schem, (who all died in "kiddush hashem") by completing the oath to Josef and burying him there and later Narchon (of the tribe of Juda) also responsible for the opening of the sea. Serach bat Asher who was closest to Josef (unfortunatly slavery got in the way of their wedding) was the only survivor of the generation when the family of Jacob entered Egypt. The 70 elders therefore took counsel with her to see if Moses was the Messiah. She was not impressed by the miracles, but when the words "pakod pakodeti" were reported to her she proclaimed that Moses was the savior. These words were the words were the reminder of the oath given by the 70 of the generation of Josef that the bones of her beloved Josef were to be brought to Shchem (flattering for the elders). The Israeli National Anthem, "Hatkva"(hope) concludes with the word "(The land of the zion (mortal remains) and Jerusalem)"
"Nachamo, Nachamo ami...." (Console yourselves, console yourselves, my people...) And ends "איש לא נעדר" (a man will not be missing). The two Shabbat candles which we call The Shabbas light (peace, holy day of rest) can be compared to the two eyes of Samson and Rachel both of whose prayers will be answered in a single day. That day when all our eyes will be opened and the Phillistines (invaders in Hebrew) will be chased from the land. משה רבנו בא למנסה לשכנע את זקני ישראל בעובדה שהגאולה באמת מתחילה. הנסיון לשכנע הוא לא קל ומשה משתמש במילים "פקוד יפקוד", "פקוד פקדתי". חכמים מתארים במדרש איך שזקני ישראל באים אל סרח בת אשר ואומרים לה הגיע איש וטוען שהגיעה הגאולה, הוא עושה מופתים, ובת אשר מבטלת את הדבר. אבל כשהם אומרים לה שהוא אמר "פקוד פקדתי", היא אומרת זה האיש, זה הגואל. How did Jitro become the name of the key Parasha when the Torah is given to Israel on Mt Sinai? Jitro does not follow the advice of Moses, the opposit occures. An unwise decision by Moshe Rabbenu that is only corrected in the year 1190 (common era) by Moshe Ben Maimon who writes two books, one for Jews and one for Gentiles. Gd also makes an attempt to save the situation or at least give guidance... Moses is asked to go up.alone. Then to come down to bring the priests back up with him. Gd had told Moses that he would only be talking to him and would allow Ahron to be his mouth piece. Jitro had tricked Moses into dissobeying Gd. I believe he was well intentioned, but he destroyed the position Moses was meant to hold, and also the Nation of Israel. The opposite occures in Shushan when unwittingly, Haman, unites the whole nation as one man behind Mordecai...the first Jew. Moses had no business following the advice of a gentile when it meant dissobeying Gd. Maybe Moses only saw the good in people... Was he unaware that Jitro had taken back his daughter as a wife, a normal thing for a Midianite? Moses called his first son Gershom optimistically believing that he would be Ok with Jitro. He calls his second son Eliezer because he was saved from Pharoh..., but that happened 60 years earlier. Moses realized that the stay with Jitro was no success story, still he chose to see the good. He sent his wife and children back when he became worried that Gd hardning the heart of Pharo would be fatal for his family. That was a mistake and the Druze are not afraid of Egyptians til this day. Gershon was a 60 year old warrior, his mother could do a bris without assistance to her 8day old baby. Hardly wimps. Moses was right about Jitro being of assistance in settling the land, this took place at a crucial time in the late 1940s when the Druzies fought the Arabs to enable the Jewish colony to establish itself. The Haftarah again notes the two sides of giving the Torah for peace when the Profet ..... Is asked to come with his son named "the rest of the village". The holy profet and the regular villagers, both need to work in harmony for the shabbat light to exist. The three days of ninve and the three days of shosha. Midianites have their qualities, but don t send your wife to them for safe keeping. The "resist" movement is having an adverse effect on a key strategic country: Ukraine. The fate of P. Poroshenko (March 30), PM Netanyahu (April 9) and last but far from least, Gazprom (Jan 2020) depend on the Project to bring Rabbi Nachman to Jerusalem. Play the cards right and terror and crime will decrease. Learn from King Hassan II who made a gesture that worked very successfully for him. He took his private money and sent 22 bodies of the shipwrecked Egoz to Israel for a burial that was attended by over 60 000 Jewish Moroccans and their friends. If you offered one months Presidential salary to President Poroshenko to get this operation accomplished before his election, he would be challenged to show his skill and your victory would be even greater than that of moving the Embassy to Jerusalem. Rabbi Nachman says both Moshe and Mordecai are the Messiah. Is this a contradiction? Rabbi Nachman also says the Messiah will be a known Na Nach and no one will expect him, but there will be no debate about it. He also compares Napoleon to himself and calls Bonaparte the son of the servant. This son of the servant introduced the metric system to the whole world except USA, but somehow techno-leadership still comes from that great nation and they promoted English to the world, not French. They also got all of the mid-west and far-west without shooting a single bullet at the French! Rabbi Israel also says that he cannot give the explanation about the "current events" sipourey maasiotes or fairy tales, this, the Messiah will do. In a tale he speaks about an instrument that makes all the animals sing (but not talk). In that same tale about a garden with a statue that once placing properly causes fear to dissapear and peace to return to the garden. The second test is another version of the same thing. And it is the shoshana of Mordecai that saves from ferocioys animals! So who is Mordecai? Mordecai was from the lowly and pretentious tribe of Benjamin, the Roman Wolf. The cause of the desacration of the Second Temple (Roman Law Prosbol (and slavery)). He who imported unbased hatred back from Babylon to Jerusalem. In fact after saving Am Israel from extinction and creating the Jewish Nation, he was demoted in the San Hedrin of 70. The 127 nations of the world accepted Him as their priest in chief. Who was he to merit this position, a position that came to him because Haman/Amalek called Israel "Am Mordecai"? The main merit of Mordecai is he had no merit. Even his claim to fame was that the girl he was raising to become his wife was captured by the King and remarkably, (it was) by an act of Gd she had no appetite as a result of which, she was extremely intelligent. Mordecai had inherited a lowly trait from a lowly relative, but he was the best at it! He was possibly MORE brazen then Shimi ben Salo who cursed King David in front of his whole army....find the Democrat who would do that to Donald Trump today and you will find many...obviously the times are deteriorating! In the good old days of Shushan no one was like this except Mordecai. Gd in his unbounded mercy, wisdom and power reversed the situation by creating an absolute leader in the merit of King David who had Solomon execute Shimi only after he had procreated (to later confront Amalek who escaped from King Saul)...as much as was still possible. That instrument that makes animals sing (mentioned above) can get us through the gate. However, only when the statue of the man in put in position and the shoshana on the throne, will Messiah be able to sit on his throne awaiting to finally be crowned so Gd can reign alone over the Universe. Could this be the last generation? Pakod pakodeti, Na Nach Nachma Nachman Meuman. How to know if the aggressor is good or evil ? Pharoh wanted to take the animals, make us slaves, take the loot and kill us. Now that seems illogical since the slaughter would logically be the first step followed by the other three in reverse order. The Torah explains that in pursuing us he would first catch up with the cattle, then the children women and old folks, then the gold and silver and finally, the men. This is the way you can recognize Nazis. They begin by weakening you through bureaucratic hassles ID you. then they seperate families, work you to death, then they eliminate you (genocide). The good guys usually try to knock out the faulty leadership and reeducate the population or bring them back to pre-madness condition. This is the exact opposite operation. In the case of Pharoh... the sole survivor from the sea of reeds, he became the leader of Ninve and led his citizens to repentence or at least fearing Gd. (He was knocked off, but got a second chance). Now you can more easily ID the bad guys. Today is a HUGE DAY for mankind. The correction of the relationship between Ukraine and the Jews. Today is the first day of the year for trees, for Ebay ha Nachal (the first book of the presidency of Israel co authored by it's first Minister of Education and all the people on the old banknotes including Odesser on the coin by his name). Today is the birthday of the village of Ebay Ha Nachal. Today is the birthday of the great sage of Rabbi Nachman who could replace the 60 sages of the Bal Shem Tov with only one man. Today a saint that Rachel cried 3533 years to merit is about to be honored by the Patriarch of Kiev and in so doing all the priesthoods that associate themselves with the Patriach of Kiev become holy like the priests of Egypt in the time of Josef who is only 20 years of tears for Rachel. Unification of Israel is vital. It took place when we had no water and we complained that I and my son will die of thirst...one united complaint. Thirst for truth....Unification also took place when Haman called the nation of Mordecai, the Jew into existance. Mordecai owed his amazing brazeness to his great grandfather Shimi, speared death during the reign of King David and executed after the Kings death. Gd was merciful. By the merit of the song Na Nach Nachma Nachman Meuman, a song which purifies from all sadness and gives everyone a new start, Gd will unite the Jews and save all of Israel. This is the last generation, the people that love only money will dissapear. We will keepb the promise from above. Ninve and Shoshan will celebrate Shabbas together! Some on Friday, some on Sunday maybe every day, maybe night will exist no more. This is my prayer in the merit of David and Esther Cohen, that married today. What is more valuable, a student or a son? There is an answer and it is not a cop out like: what student and what son. Assume both are on exactly the same level in knowledge which is closer to the father? Even forget Rabbi Nachman's example of the son that was ready to act like a servant in order to please his father. What is preferable to the father? A student or a son? Only the ages of the forfathers of Pinchas are mentionned, not those of Moses. 137, 137 and 134. The age of Moses is inferior: 120. 17 appears twice, the age of Josef when he went to Egypt and the number of years of Exile of Jacob when he returned from Egypt. Moses was called good (17) two times when he was born. The days of the life of Jacob were good only when ge was with Josef. Josef was born from the tears (20 years) of Rachel and was not a son of Jacob, he was the kind of different she cried 3533 years for until this year bh when Nachamo nachamo will not be missing from Jerusalem. Moses begot two sons which dissapear with their mother as soon as they appear. The father did not make the brit, Eliezer like Gershom remained strangers. Moses descendants are Druzies. Ahron s descendents represent the holy holy holy Cohens. The Jewish nation became holy holy holy in Shushan with the three day fast completing our separation from the lusts of this world (holy if we maintain our happiness). Holy is just fine, is a happy secular Jew a holy Cohen? Yes of course he is. He is like the sons of Ahron, he is a son. What is a religious Jew then? Ahh, a religious Jew is a student, who studies the teachings of Moses. The reward of the fathers of Pichas were 17 years here below. The reward of Moses are all the good (treasures) of heaven which are no less than Divine Understanding. Happy s he who leaves millions of students behind and continues his studies in the next world. Rabbi Nachman ordered his chair changed intoba stretcher.. Rabbi Nachman ordered the hassds to make a stretcher out of his chair. This is the stretcher that "flew" above the crowd when they went to bury Rabbi Nachman. The hevra kadisha guy streched his hands out to put the body of Rabbi Nachman in and there was a great flash of light. Rabbi Nachman reapared in his final resting place. No one touched him. My guess is he is complete and the chair-stretcher is there with him for further transportation to Israel! The man present at each brit. The tzadik that keeps returning. The one whose name is like the Tamid on the alter. The one whose mere name rejuvinates and cancels all sadness. The one who made the world aware of the sanctity of the brit. The one who never tasted death. This is a Historic Novelty.. Roman Law has finally succombed thanks to Moses! Why did Moses call his older son Gershon and the second one Eliezer? It should have been the opposite! Gershon (I am a foreigner here) and Eliezer (Gd helped me leave Egypt). Folks, this Hiddush will change EVERYTHING. Roman law says that land BELONGS to the strongest "wolf". Not so with students and sons of Moses that at best are only "foreigners" and because we accept that all land belongs to Gd ... he helps us. May we accept along with Moses that any authority we have is only to enforce his ownership of all property. The fact that Moses said this is the proof that he is qualified. Why would anyone equate circumbcision with lips and why would a father put his lips on a new circumbcision? It really needs to be the father. The word for word in Hebrew is "Mila" in Hebrew, this word also means circumbcision. "The Creation" is the result of words of Gd, so this is THE foundation..without words, no creation. Remember that there is a saint, foundation of the world, forgetting this makes all wisdom pure vanity or "air" as King Solomon would say in Kohelet. Ahron in Hebrew means closet or coffin...so when his brother "coffin" came it was a form of encouragement for Moses. I had to be an emotional moment for someone forced to hide his identity and live a lie. He could be with his real brother someone eloquent who had never had to hide who he really was. Mitzraim is the Hebrew word for Egypt it also means "dire straits" or "tightened throat". The Kerch Straits and the Bosporus are like this... Rabbi Nachman needs to be brought through there. No Saint or Sage could show his face if it were not by the merit of the simple honest merchants who live by their word. Only olive oil in this case, not petrolium and not whale blubber, not the BIG INDUSTRY mass produced stuff.... here we are talking about Oil produced on YOUR (privat) LAND. More than that.. dig deeper... each container could contain whatever amount but the oil would burn for the same amount of days!!!! That is the miracle, all are equal (also different) what make everyone shine like the sun at midday is the teaching of Rabbi Nachman!!! Why did Jacob consider the small vessels more important than even Rachel and Josef? We know that in his confrontation with Esav a very materialistic man, Josef had set up plans of escape. There was no knowing what Esav would do. The most important thing in the eyes of Jacob seems to have been protecting the "small vessels" there was even a fight with the angel of Esav over this. Why were these so important? We all know Jacob was no idolator.. Although he had earned very little personally over the 20 years he had worked for his uncle, he had saved a "tith" which he intended to bring to Israel. This tith was nothing materialistic, it was the fulfillment of his oath to Gd. This was the ultimate test of Jacob. There was no way he would not make good on his word. This is what characterises Jacob the most. Indeed he passes on the lesson to Josef when he makes him swear to bury his bones in Israel. This oath has become Pakod Pakodeti and when it is fulfilled the world will become three groups. The House of Josef, the house of Israel and the house of Esav. Materialism will vanish like shaff. What is happening at the un now? All current legal systems today are based on Roman law, you can call it the "law of the land" but it is not that, really it has become materialist to a degree that it is no longer even Noahid, it is pre-flood. Once land belonged to the King. This was a rule established by Josef as a result of the 7 year famine in Egypt. What makes it "rain"? The famine was preceded by wealth so humanity has learned to harvest storable goods and to squirl away for economic cycles. Thus the banking system and interest. Land rights also became a commodity. Rights to be enforced require the legal use of force, because force by itself gives the right (according to the Nazis). The tith would go to the bank which would then redistribute according to its own private best interest. What if the assumption that a famine is preceded by wealth is not a law of nature but rather a biblical event recorded as historical. Gd is not Empirical. What makes it rain? What is the Roman "law of the land"? It states that a writ enforced by the police makes real estate private property. Much like tribal hunting grounds for wolves. The strongest tribe rules. So the police are the wolves and they divide up the area of influence where civilians are the prey. According to Mosaic Law land rights were established when the tribes entered Israel and can never be altered or sold. This meant that there was no need for Police as it was the priests that determined these issues, fear of Gd was enough. Either its Gd or its the dog. Noahides no longer eat flesh off living beings, but that changed back with the Roman wolf. He is not responsible according to the legend, the babies were saved by the milk of wolves. Thus the tribe of Benjamin the wolf-like tribe took over and brought humanity back to pre-flood violence. The good news is that Mordecai and Esther were from this tribe and the switched into the father and mother of The Jews. Jews are the tribe of Josef the priest, we have been altered by three dark days in Egypt, three days of celibacy on Sinai and three days of fasting for Esther. Also good to know that Achachverosh and Esther fathered all 127 nations of Israel. Materialistic Esav, and Amalek will dissapear like chaff. The UN will be United when the bring the bonesvof the second son of Rachel to the appropriate location. As truth becomes more scarce it becomes more precious. When something becomes scarce the value goes up. Each person is so unique that Rabbi Nachman says the whole world was only created for him/her (he + she?). Of course the uniqueness is scarce, the divine and infinite point. Unfortunately most people never find it in themselves. On yet a higher dimension, there is something I term "common truth". This is even harder to find than individual truth. Gd cursed the earth which caused lazy men to enslave others. The flood reached everywhere except Jerusalem where freedom and the fear of Gd were still in fashion. The purification didn t last past the curse of Noach which rapidly threw mankind into the hands of killers, rapists and even warwolves. The eyes only see lies. World of foolishness and no firm ground to stand on. Because Gd is merciful, you need to understand that this situation can only be a mistake. We need to repair the curse of Noach...and since without truth freedom can not exist, only real search for truth can reverse the curse. One who is seeking the truth is no longer a slave. Slaves are absolutely worthless today.. Free men are so scarce that they have no price. Like Rabbi Nachman said... Each man needs to understand the whole world was only created for him. Do really search the truth...if you aren t doing so you are no better than a zombie. The generation of the flood was in front of Gd sinning and yet Noah is criticized for following Gd, while Abraham is praised for walking in front of Gd. Gd did create the situation that lead to the flood, because when he cursed the earth because of Cain, he made the flood a necessity, to bring blessing back to the earth. Adam could have blessed the fruit and avoided a lot of trouble? Eve and the snake were not at fault for not making a blessing. Noach follows in his footsteps and curses Ham instead of blessing Shem and Yafet., the blessings come only after the unnecessary and very useless curse that lead to the tower of Babel construction by the greatest hunter and dictator of all times. Please Never curse always find where to make a blessing instead. The single most popular move you have made (judging by the applause) was moving the US Embassy to Jerusalem (which is extremely well run except on the 4th of July, when no Americans can be found). Also, congratulations on your daughter in law, Lara Trump, she is a fantastic speaker for you. If moving the Embassy was popular, bringing Rabbi Nachman's remains to Jerusalem will be much more appreciated even by Muslims and Greek Orthodox, the original Christian Church, located in a Muslim allied country of the United States. Very unfortunately towards the end of your second year, I believe you have made the first real mistake of your administration in how you have handled the Khashoggi execution. Before I detail why this was a mistake, the good news is that the harm can be undone. A zealous Arabic Prince inheritor of the two Mosques wants to show the world that he is righteous and fights for justice by eliminating corruption. Although he is a Royal, he befriends a Jewish relative of the greatest of Presidents. Yet when he makes an act that very possibly was not executed exactly as he ordered, the President he trusted, does not have his back, publicly embarrassing the King. Being a religious man, the Prince might now justify an opinion that he is closer to Gd then the President...this is not good for anyone. Another would be ally, Mexico, needs to hear from you that if they open controlled live fire on migrants (which could be justified as it is on the Gaza border) the USA will not treat them like we treated Prince Mohammad Bin Salman of Saudi Arabia our 40 + year ally, working with us very effectively at the present time, to establish Peace in the Middle East. Incidentally, the Saudis do not have an illegal immigration problem do they? Like I stated earlier..first mistake, late in the term, but a BIG mistake, none the less. The corrective measure is to work together with the Prince and with Turkey, Iran and Constantinople Patriarch to bring the remains of an international Jewish Saint to Jerusalem, the Capital of Monotheism and of the Jewish State. Rabbi Odesser calls himself the great Eagle and Rabbi Nachman mentions this eagle in the story of the Blind Beggar. He is always new and infinitely old and wise. He is so wise that he remembers "nothing". The Metropolitan and the President have in common that their symbol is the eagle. In each room of the White House and on the "crown" of the Patriarch of Kiev (well not exactly it IS a cross that looks a bit different). Could this mean that they too are students of Rav Israel... I think so, let's see. Rabbi Nachman has this strange quote "ve ha machshala tachat yadecha" and the weakness is beneath your hand. We know Moses could not be taken to Israel because he had used his hand thereby disobeying Gd by not speaking to the stone (do I hear "stony heart"?). The first part of the "Petek" of Rabbi Nachman (as revealed on page 242 of the book called Na Nach (two types of Jews -last lines)), is called "the letter". This letter has exactly the shape of the hand with the middle finger and pinky exchanges because they are the longest and shortest lines / fingers and both start with very. Each finger corresponds to a biblical character, but more importantly Rabbi Nachmans' message is written on the hand clearly to all of us. Like in the story of the Master of Prayer who includes a wise man with everything written on the hand of the King, but which he only keeps a copy of. Saba did say a photocopy is exactly like the original! Jumping to the bottom line ... if you take the Petek and it's letter seriously , YOU are under the hand of Gd and no matter how "weak" you are you are in fact infinitely powerful since the hand of Gd is above you. Your Excellency, The President of the United States, Mr. Donald Trump Sr.
You, as Christian, could become the next leader of the famous Jewish Hassidout called Breslev. This movement already fills half the Kotel (Western Wall) on Rosh Hashana, with your blessing, not only would this movement fill the whole area during Rosh Hashana, but the Jewish Nation as ONE including those living overseas, would give you their full support. You will win without question the battle of Public Opinion, also internationally. 1) Josef was taken out of the pit on Rosh Hashana. Psalm 81.6 is explained in Masechet Rosh Hashana 10(b) on the last (bottom) line. (Notice triple undeniable connection to the pregnant woman from revelations). 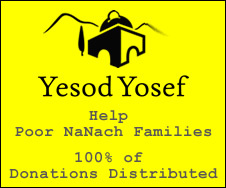 2) Josef and Rabbi Nachman are Both born from the tears of Rachel and are born without ANY sexual lust. 3) He who connects to one that is pure is pure. Keeping the oath to Jacob is what made the fallen Yehuda the first of all the modern world Dynasties. Keeping the "Oath From Above" ordered by Gd through Josef is on a much much higher level then the promise of Yehuda to Jacob. 4) It was the Crown Prince Charles that claimed the title of "Defender if All Faiths". You Sir can simply become the "LEADER of all Faiths", with the Priestly Nation (Jewish), finally UNITED, giving you their undivided support....and more importantly...Gd himself putting the forces of nature under your jurisdiction for PROPER use (he will certainly advise you). 5) The self declared King, Na Nach - [Rabbi Nachman, was the second son of Rachel, named Na Nach he is the 12th Imam, the still unrevealed spiritual leader of the Shah (the Shah is in your jurisdiction this is the best school for him)] - called the United States the Kingdom of Kindness. So be it. Millions of people are suffering unnecessary starvation, violence and SLAVERY day. Because of the leadership of a man who is himself "the silver trumpet" (YOU SIR) and who could and must be followed by two (or three) "Mikes"(amplifiers). The practice of SLAVERY, the result of sexual immorality, hated by Gd, could be abolished forever. This is my New Year Blessing to your Gracious Excellency. You are the hope of all Israel, the one Executive Action that will establish your permanent victory over evil, will be the keeping of the oath from above (PAKOD pakodeti- last year) this year (gallop/lope). Let us humbly accept that the best prayer around is still the one said by the best people around in every public school in the United States of America: the pledge of allegiance. Sept 8th (Shabbat Shalom, very close to Rosh Hashana) was the wedding anniversary of President Poroshenko....maybe he will merit to do something extremely smart for all of us. There is still a little time? Adam and Eve, a womans' role? You know the divine breath of life was given to a golem called Adam. From this Golem a rib was taken...and this rib was not given the divine breath of life. On the other hand you get prodgedies like Esther and Asher, who don't need to ask any man what to do and who great leaders like Mordecai or Jacob trust more than any man in their generations. In Halacha to know who a woman is, you look at ther father and brother. This is no coincidence. The father and brother are the ones that nourish the young female "golem". Once she has retained her learning, and she does this better than her male counterparts, she then expands it...the student has twice the power of the master. The very great figures in Judaism had no choice but to "adopt" a young woman and raise her til marriageable age. The other surprise is they actually do not need to "procreate" physically, because at such a high level things happen using the rules that came before creation and not the other way around. THus Mordecai and Esther begot all those that call themselves "Jews" today. The Dynasty of Rabbi Nachman was similarily created through the marriage of Rabbi Nachman and a lovely rich young woman who never spent one night after their marriage in the same town as her husband, in fact they never slept together or even touched! Just thought you might want to check on this if it is true or false. How does dancing sweeten the harsh judgement? The offering of King David "Korban le ani" offering of the poor, makes little sense... why would a King offer a bird to Gd? In fact King David would play a violin, which as everyone knows carries the name of a bird...each violin has such a name. SO the motion of the bow is like a shechita and Gd accepts it as such. If a man is not accompanied in his singing by an instrument, what can he use? He will dance and thus keep the beat and the dancing replaces the instrument. The energy used burns fat, water, blood. The man changes his dancing body into the animal instead of the instrument. the same way and maybe more than a bird sacrifice. I'm sure a 4.1 % GDP growth is a big success... what we want now has to be higher, like,...above 5.3%!! This kind of success is possible even including a 10% flat tax to be self imposed (as a blessing by a generous and grateful nation of believers) by citizens... do not be surprised. Kim is apparently your friend since he has sent 55 US Heroes for burial at Arlington Cemetery, and he was gratefully able to do this, really, thanks to you and Gd alone. The main theme when relating to the dead is Glory, and similarly, Glory is the underlying theme of creation whose purpose is his own Glory. Simply, you are touching the "blood" or the "life" of creation. Here on earth "wealth" is glory or it can be "gory" depending on who is managing it. The most brilliant part of your speech was: "made in America no longer just a slogan, it's a way of life!" Do not let any other nation take away your leadership with this project, because it holds all the glory of creation and you are the one who can bring all this TO LIFE!!! Lechaim!!! So what happens if Rabbi Nachman is not brought back in the year 242/70 Pakod Pakodeti? You know what Gd said to Moses? -I will harden Pharaoh's heart in order to show wonders. I am sure the children of Israel saw no need for this and would much rather have come out the first time. Then again, both Rachel and Samson say something very strange (respectively) "add me another, different, son" and "remember me remember me to avenge me at one time for both my eyes". Esther is no exception to this strangeness, when Achachverosh makes it clear he wants to hand the crown over to Mordecai, she decides instead that she wants another day like this one...hence we do a second day in Shushan (walled cities)... and this Sunday we will all be saying "Nachamo Nachamo ami.." .which ends with "a man will not be missing". The time had not come yet... and has it come now? This year is the year so logically, (look at previous posts) we have the opportunity of receiving Rabbi Nachman. "Unfortunately" but for a few Capos and depressed souls (losers).... COMPLETELY WRONG. Pharaoh uses go betweens so as not to take the blame for his grossly unjust decisions and to confuse the hate directed against him. Why bother too much with the go betweens? They bend whichever way the wind blows? There is obviously a force fighting tooth and nail to PREVENT Rabbi Nachman from being buried in the correct place. Gd will deal personally with this force just as he did with Pharaoh. The gauntlet has been thrown. The race is on. The noblemen spoke up to him, "Still, even though we have seen from you such a thing, nevertheless for the sake of one thing you do not yet deserve to be given the kingship. We will try you further with one thing. Inasmuch as there is a throne here from the king who was, and the throne is very high and by the throne stand all sorts of animals and birds carved out of wood: And in front of the throne stands a little bed, and by the bed stands a table, and on the table stands a lamp. And from the throne emerge paved roads and the roads are walled and the roads go out from the throne to all sides [zaytin; see abovewhere it is spelled with a tzaddi], and no man knows whatsoever what it is, the matter of the throne with these roads. And these roads, when they go out and extend for some piece [i.e. distance] — a golden lion is standing there. And if some man should go to it, it will open its mouth and swallow him down. And beyond this lion the road extends even further, and likewise with the rest of the roads that go out from the throne. That is, with another road that goes out from the throne to another side it is also like that: when the road extends away a piece, a different animal is standing there, namely a leopard [Yid. lempert, Heb. lavi' lion] of ironwork. And there too one cannot go to it (as before, because it will swallow him down). And beyond the leopard the road extends further, and so it is with the rest of the roads. And these selfsame roads extend and go throughout the entire land, and no man whatsoever knows what is the thing of the throne with all these things and the roads. Therefore you shall be tested with this, whether you will be able to know the matter of the throne with all these things." They showed him the throne and he saw that it was very high, etc. He went to the throne, took a look and understood that the throne was made of the little box's wood (that is, the instrument that the man of the forest had given him). He looked some more and he saw the throne is lacking some little rose at the top [rayzile, Heb. shoshanah], and if the throne would have this rose the throne would have the power of the little box (that is, the aforementioned instrument which had the power that when one would lay the instrument on some beast or animal it began to play, as mentioned). He looked some more and he saw that this rose which is missing at the top of the throne, this rose is lying at the bottom in the throne. One needs to take the little rose out from below and seat it above and thus the throne will have the power of the little box. For the king who had beenhad done everything with wisdom and had disguised everything in order that no one should understand the matter — what it means — until there would come such an extraordinarily great sage who would surmise and would be able to hit upon interchanging everything and arranging all the things as needed. If your first act in the Oval Office was to have the bust of Sir Winston Churchill brought back, to me, that means you want Total Victory. Why would a man named Trump not want total victory if by placing America first he can change every last American into a Trump? (a 7 of Trumps is stronger than a King of hearts or an ace of spades). We are seeing this happening with our own eyes! Since I also am interested in Total Victory, I need to give you a heads up just in case you haven't noticed. As you know Kings are surrounded by courts that are usually enemies of the people and of the King... this you know as well as Louis the XIV for example. That same survival problem is also faced by the leading Rabbis who reveal laws of holiness that are neither respected observed or enforced by their courts, even worse, they make sure no one is to follow them. One such law is the obligation to re-bury Jews in the Holy Land. Law 363 neither respected by Shass (360) or Gimmel (3) is the law that states that the sons of the deceased MUST DISOBEY a will written by their father for his bones to be kept in a foreign country. In this case both political rabbinic parties are dishonoring the law as stated by their own leader. Any Christian could step in here and put them to shame by practicing Jewish Law, if this were done by the leader of the land of the free and the home of the brave, this would make perfect sense. President Poroshenko and Prime Minister Grossman may need your help just as the Chief Rabbi does. You have observed how the North Korean do not allow their leader to make good on his promises to you, regarding American Army heroes destined for the holy grounds of Arlington Cemetery. The Ukrainian Government is behaving very unusually in claiming that the Poles have destroyed a Monument honoring the Ukrainian Genocide of Poles during WWII and this as a pretext to pass a new law forbidding that bodies be taken out of Ukrainian soil.. what right do they have to do something like this? Both these issues touch on a biblical issue of greater importance than the Exodus from Egypt. This ONE issue is the issue that puts an otherwise "delinquent" Yehuda as "King" over all the Tribes of Israel and gives him King David and the Messiah as descendents. Pakod Pakodeti is the code word and promise of the redemption (this Jewish year by numerical value). It involves bringing the second son of Rachel for burial to Zion and what could be more Zion than Mt Zion where King David is buried, is not this burial site THE property of the King of Juda? Who is the King of trumps if not Trump himself? Kush means Africa and Ner means light, Kushner means light from Africa. Yehuda, Trump and Kushner all have the symbolism of complete jump from darkest or lowest to all powerful and highest. No one needs to feel left out from this round up. The way to make this happen of course, is to order President Poroshenko to remove the remains of Rabbi Nachman for burial in Israel. This is Jewish Law and no Rabbi dare deny it. The crown Prince of Saudi Arabia or Mr. Roman Abraminovitch can handsomely increase the value of their Yachts by participating in this project. Reception at shore in Israel will be nothing short of grandiose. The light rail station of the old city is already rightly named President Donald Trump Terminal. We will be expecting millions of PILGRIMS from all nations and all faiths, for Rabbi Nachman is the long awaited second son of Rachel and the source of Peace and Prosperity when he is placed at the correct location, even more so than the US Embassy. You will proudly present Sir Winston Churchill with the Total Victory he requested. Our Total Victory is the last thing the Devil wants, so you can expect strange things to happen, but do not be dismayed.